My custom wood pens are handcrafted from: Cocobolo, Pernambuco, Rosewood, Birdseye Maple, Mesquite, Tulipwood, Cardinalwood, Dymondwood, Satine, Deer Antler, Texas Ebony, Tambootie, Bethlehem Olive Wood, Ancient Kauri Wood and more! This first group of very colorful pens is crafted from "Dymondwood" which is laminated North American Birch, cut into thin strips, dyed, and reassembled into blocks using special resins and high pressure. The resulting block is very stable, colorful and can be cut in various ways to achieve dramatic patterns. 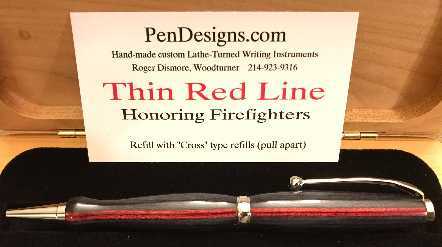 The finished pen is buffed to a high gloss finish that will stay on for the life of the pen. Also check out my Spectraply pens seen below, that are new for 2015!!! All Dismore Woodworks ballpoints use "Cross" type refills that you can find at office supply stores, have Platinum hardware that will look great for the life of the pen and not wear off, include a free solid maple gift box, and are only $45 unless indicated otherwise. Since 1996, Cocobolo has been my best selling wood! I have begun crafting some new pens from a wonderful laminated, dyed birch material from Frogblanks.com a USA company that has excellent manufacturing standards and unique products for woodturners. My first five custom pens turned from these woods are listed below. Enjoy! Free solid maple case shown below (you will see similar cases as a $10.00-$18.00 option on other websites) is included with all my CUSTOM WOOD PENS for a classy gift presentation. No cheap plastic boxes here! Included in each case is a wood identification card and refill instructions for the custom pen you have ordered. This entire website, including all text and photographs is registered with the Library of Congress and I hold a valid certificate of registration. Willful infringement of this copyright will result in prosecution, with statutory damages of up to $150,000 plus attorneys fees.